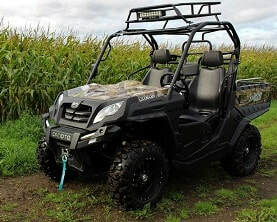 A utility vehicle or UTV vehicle has become one of the preferred ways of transportation by gamekeepers, landowners and hunters. 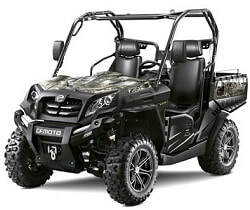 CF Moto are the manufacturers of these highly capable utility vehicles which are at the same time very reliable and extremely practical, making them highly desirable for farming, agricultural and forestry uses. The UTV vehicle will transport a much larger load than a farm quad, being feed or other cargo, and comes with a large tipping rear storage compartment, controlled by gas struts, for easy unloading. 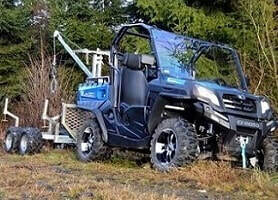 It is very easy to get on and off a utility vehicle for access to gates which makes it very versatile. These road legal UTV vehicles have powerful speed, total control and excellent manoeuvrability, driving safely on rough, uneven grounds and in dry or wet weather conditions. Our side by side UTV vehicles have optional 2 or 4WD and are equipped with truck-like cabs and seats which makes them very comfortable and safe for the occupants. The utility vehicles have perfect stability for going up or down hills, improving the driver's experience. If you need to travel across different terrains, transporting tools or other equipment whilst carrying a passenger, a utility vehicle will enable you to do that quicker, saving time and making life easier. Utility vehicles are ideal for hauling loads, transporting and driving around. 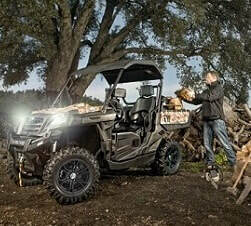 The UTV vehicle 800 diesel is perfect for agricultural, farm and other on and off-road uses. Exclusive to Quadzilla dealers in the UK and Ireland, these UTV vehicles have been tried and tested to achieve optimal performance and maximum capabilities. Built with a tight steering lock for easy manoeuvring, this utility vehicle has engine braking and easily accessible grease and service points. 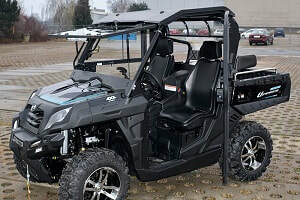 The UTV 800 side by side vehicle has a solid chassis with ample suspension, power-steering and a 4-W drive system with front and rear diff locks. These utility vehicles can be registered as road legal. Selectable 2/4WD with diff lock. Powerful electric winch with remote gas assisted tipping bed. Gas assisted tipper back body. Fully enclosed frost proof cab as standard (designed in France). Front and rear diff lock. Tow hitch and trailer hook-up. Engine Perkins diesel 3 cylinder (manufactured in Japan). Transmission CVT automatic (manufactured in Canada). Suspension double A-arm front travel 151 mm. ​Rear suspension travel 146 mm. This is larger than on most UTV vehicles. Wheels 26" tyres on black steel rims. Category homologated T1a (fully road legal PLG or agricultural vehicle. Available in green and camo colours. 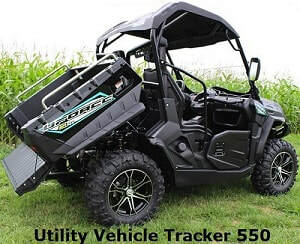 The utility vehicle 800 Tracker has the multi-functional characteristics of previous UTV models with an added new design and perfected features. These improved, farm UTV vehicles can be driven anywhere on a full car driver's licence, which makes them ideal for those situations when an everyday vehicle wouldn't be suitable. Being road legal, the newly improved UTV is a fantastic buy as a utility vehicle for off-road agricultural and farm uses or for enjoyment and leisure. 3-point seat-belts - safety doors. 14" alloy wheels. Tow hitch. 7-pin trailer hook up. Road style mirrors. Full cab kit with heater available. 2 years manufacturers warranty subject to mileage limitation. Brakes: Front and rear hydraulic. Suspension: Front and rear independent. Dimensions: L2980 x H1465 x W1850 mm. ​This utility vehicle is available with a roof rack and LED spot lights. Utility vehicle Tracker 800EPS 4X4 (Old model). This CF Moto utility vehicle has a steel front bumper, power winch, alloy wheels, 3 point seat belts, safety doors and electronic power steering as standard. This UTV vehicle has a multi functional switch for headlights and horn. The tracker 800EPS has outstanding acceleration (from 0 to 60 km/ph in 3.38 seconds) and exceptional control. 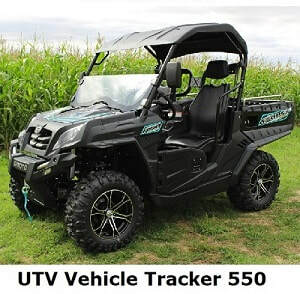 The large under seat storage compartment and a functional dashboard display amongst other interesting features, makes this UTV vehicle a desirable machine for working on a farm or for leisure uses, with a very affordable tag price. ​The 4x4 utility vehicle gives you the choice of switching between 2 and 4 wheel drive for a more comfortable ride and offers differential lock when required for driving under extreme off-road conditions. This road legal UTV vehicle has optional roof and half screen. Available fully enclosed retro-fit cab with heater and wipers. Winch. Tow hitch as standard. Engine: 800cc electronic fuel injection V-twin - 2 cylinder. Cooling: Liquid cooled. Start: Electric start - ECU ignition. Transmission: CVT with reverse. Suspension: Dual A-arm front and rear. Front - Rear oil damped shocks. Brakes: Hydraulic discs all round. Dimensions: L2973 X H1430 X W1883 mm. 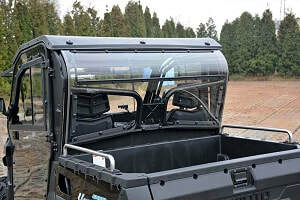 The side by side Tracker 550 and 800 utility vehicle models can have a full poly-carbonate screen fitted if required. Call us on 0845 3731 832 for more information or a quotation. This is a contemporary road legal utility vehicle that can be driven anywhere and everywhere for having fun leisure time or for working and tackling all sort of farm jobs. The New Tracker 550 EPS utility vehicle from CF Moto has some amazing features such as a powerful electric winch with remote gas assisted tipping bed, electronic power steering, 3 point seat belts, safety doors, high intensity projector headlights, alloy wheels etc. 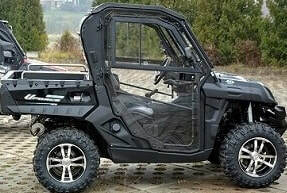 This latest generation of CF Moto utility vehicle has optional roof and half screen. Engine: 495cc electronic fuel Injection single cylinder - 4 Valve. Max torque: 46N.M/5800 rpm (de-restricted). Max power: 28KW/6800 rpm (de-restricted). Bore x stroke: 91x71.6 mm. Cooling: Liquid cooled. Start: electric start - ECU ignition. Suspension: Independent 4 wheel suspension. Brakes: Triple hydraulic disc brakes all round. Dimensions: L2980 mm x H1465 mm x W1850 mm. Payload: 150 Kg.